Are We There Yet?? : Out of the Darkness and Into the Bright! There was a time - not that long ago - when my darling daughter and wannabe artist would wear nothing but black. Black jeans, black t-shirts, black socks, black shoes, black eyeliner, black hair ... she wasn't over-the-top Goth or anything like that, she just liked black. For example - see these shoes? These very brightly colored shoes? These shoes that are anything but black? 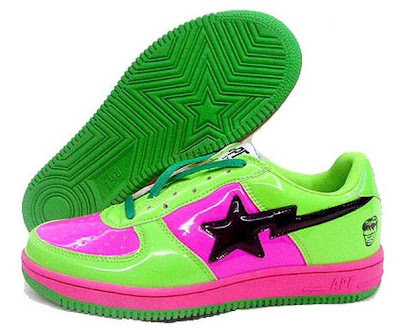 These are Bape Neon Green & Hot Pink Bapesta shoes and these are the shoes that Amanda wants for her birthday next month. Never heard of Bape shoes? Neither had I until yesterday when Amanda let out a squee from behind her computer in the dining room (which is running just fine since I completed the System Recovery on Tuesday - yay!). The squee was quickly followed by an alert on my Yahoo Messenger that told me an IM had arrived from the other side of the house. I clicked, I looked, I choked! "No, I'm not! They're perfect!" Perfect for what?? I wasn't really sure I wanted to know that! A quick search of the internet uncovered that Bathing Ape clothing, who produces the lovely shoes above, was launched in 1993 in Tokyo, Japan and the brand was the first of its kind for Japanese urban/hip hop clothing. Huh? Apparently there is a huge market for urban clothing, even in Japan, so when the company decided to market shoes they took their inspiration from Nike Air Force Ones and then put their own spin on them. The goal of Bathing Ape shoes was "never to be an athletic shoe, but rather a limited sneaker that no one else would have ever seen or dreamed of." Well bravo to them as I'd have to say they got that right! I never would have dreamed of wanting a shoe that looks like this one does - never mind actually wear them out in public! A little more research revealed that these shoes are probably not authentic "Bapes", though, as they're only - gulp - $85 and the real Bapes are made in runs of 200 and less and cost upwards of - bigger gulp - $300! Somehow, I don't believe that Amanda shall be getting a pair of genuine Bapes shoes regardless of the fact that this will be her 16th birthday and it's supposed to be special. Sorry, kiddo! Unless I win the Powerball sometime between now and the 18th of June I just can't see myself skipping the car payment to buy an expensive pair of kicks no matter how hip hop and urban they may be! However, because Amanda dares to be different I have to applaud her for having the gumption to want to stand out a bit in the crowd and I will do my best to find something a little less cost prohibitive. After all, there aren't that many urbanite hip hoppers strutting around in Norwich that one of them would put the recognize on Amanda's shoes as not being official Bapes and dime her out! Oh, and if you're wondering just what these shoes would be perfect for other than giving her band instructor yet another reason to look at her askance (he's never gotten used to her hair color! ), the answer is the July 2nd Mindless Self Indulgence concert in Hartford that she's looking forward to. Apparently it's tradition for concert-goers to dress up as outlandishly as possible for these concerts in the hopes that Jimmy will pick them out of the crowd to come up on stage with the band for a bit and that's Amanda's goal. 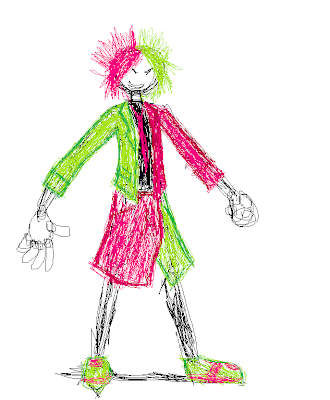 She did a quick drawing on MS Paint of the outfit she has in mind for the concert and after looking at it I can see why she said the shoes above would be perfect. After all, what better to wear with a neon green and hot pink outfit than a pair of neon green and hot pink shoes? I mean, come on, anything else might clash with her hair! WELL, all I can say is you won't lose her in the dark. Im sorry... but her band director is sooo hott! lol. in other news... Im glad for her that she seems to have found her nitch in their little counter culture! even if that nitch results in $300 shoes... and also i would liek to direct you to a youtube video that you (and amanda) would love, if you havnt seen it yet!! reminds me of the late 60s..I had neon green and pink accessories. Not shoes, though. I LOVE those shoes. I want them for myself. Or do you think they'd damage my credibility? Wow, 300 bucks for the real ones. Yikes, that's expensive. Okay, 85 is expensive enough. I like Amanda's colour style! One extreme to the next eh? Good luck keeping up with the changes! The gleam of green and gold. I'd put 'em all to shame. With rose and cherry red!